One of the more common topics typically asked on Revscene is advice on buying a used vehicle. One thing everyone has to remember is that buying any vehicle, whether it’s new or used, is a highly personal experience. What I may be interested in purchasing may be completely different to someone else. I personally prefer owning older vehicles, partially because I generally prefer their styling and partially because they’re (generally) easier and cheaper to work on. Purchasing a gently used vehicle can be a far more in-depth process than buying new, so that is what I’ll be focusing on in this article. That’s not to say that some of these tips won’t work for new vehicles, however. What Style Best Suits Your Needs? We’ve all seen posts asking for opinions of something like a NB Miata vs a BMW X3; In other words, two completely different vehicles. These drive all of us crazy because comparing the two models is basically impossible. The best thing to do when deciding to buy a vehicle is to figure out what you want. Are you looking for a family hauler, a canyon carver, a gas miser, or just something that’s highly reliable? Asking whether Car A is better than SUV C or Wagon M is a test of futility. We can’t tell you what will work best for your needs, so you need to figure it out on your own first. Also keep in mind that you don’t necessarily have to settle for a jack of all trades just because you think you may need four doors or a truck bed once every six months. You can always buy a vehicle that suits most your needs and then rent another vehicle for a day. 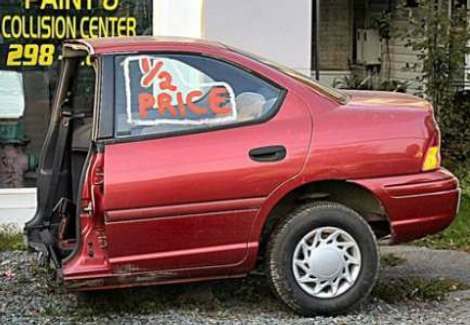 When looking for a used vehicle, never look at the maximum end of your spending spectrum. No matter how pristine or well looked after a vehicle may be, there will always be something that will need to be addressed either immediately or down the road. The amount of money you hold back will largely depend on what sort of vehicle you’re looking at and also the price bracket you’re targeting. If you`re looking for a 90`s era Civic or Corolla, chances are you can get away with holding back $500. However, if you`re looking at a Mercedes S-Class or a Land Rover, those vehicles have some potentially very, very expensive repairs in the near future. And that brings me neatly to my next point. There are many things that are universal between makes and models that you should always look out for. Carproof, Carfax and Aircare records are one source of information when it comes to potential accidents or odometer rollbacks, but they only keep records of what they’re given. Not every accident gets reported and not every vehicle has gone through an Aircare station. There are many things to keep an eye out for but the easily noticeable ones include mismatched paint, panel gaps that aren’t even on both sides, mechanical parts that either aren’t OEM or have yellow writing on them, and excessive wear and tear on a driver’s seat/steering wheel/pedals/shifter even though the odometer indicates low mileage. Another thing to look for is how well a vehicle has been maintained. Some owners are fastidious about keeping records and doing repair work on a set schedule, while other owners only fix things once they’re broken down on the side of the road. While it’s not 100% true, the likelihood of a car breaking down shortly after purchasing it from a fastidious owner drops dramatically compared to the other option. Regardless of the owner, you should always check out the car yourself or by a trusted friend or mechanic. If you don’t have a friend who’s able to help and your trusted mechanic is otherwise busy, check simple things like tire tread, brake pad thickness, if all the fluids are topped up (or at least nearly), any rust that may affect the structure, and all the electronic goodies inside the cabin. Also, check out the fuse box. If an owner is stating that there are some issues with said vehicle, a burnt fuse could be the single cause of it. Fuses are dirt cheap and extremely simple to replace. And if it saves you the hassle of having to pull half an engine apart to only determine that the knock sensor isn’t the cause of an issue, even better. While websites like Revscene are filled with members who are familiar with cars of all sorts, you’re best searching out make or model specific forums where there are likely stickied threads with all sorts of information of what to look out for. Sites like VWVortex, NASIOC and the ilk can be the best source of help you will ever need. An R51 Nissan Pathfinder was prone to rust on the driver’s side strut tower, various Honda’s have automatic transmissions that are nothing but a grenade waiting to go off, and early models of the MK4 Jetta/Golf had several common issues with their VR6 engine and window regulators. What works perfectly well on most vehicles may be a serious issue on another. Never take something that works for granted on other vehicles because it could potentially be a headache waiting to happen. Always do your research. Something to also remember is that just because a car is low mileage, that’s not an indication that you won’t have to repair it. The longer a car sits (or the shorter its weekly trip average is), the greater the chance that all the rubber needs to be replaced. Tires and gaskets all have a shelf life. Yes, gaskets don’t need to be replaced as frequently as tires, but if they aren’t kept lubed, they will dry out and crack. The same goes for the drive belts (though not in the same sense of having to be lubricated). They dry out and start cracking from a lack of use. While some belts are cheap and super easy to replace, others like timing belts and many serpentine belts on transverse engines can be time consuming and costly. Sometimes when you’re busy looking through Craigslist, Kijiji, Autotrader or Ebay, you’ll come across a deal that seems too good to be true. And, honestly, most of the time it is. That mint, low mileage FD with an asking price of $4000 is probably owned by some Nigerian prince, who’s more than happy to trade you that car (and his fortune!) for a small fee as soon as your banking information is exchanged. This is not always the case, however. It’s always worth keeping an eye out for a hidden gem. If your initial contact with the owner seems legit with the information he gives you, don’t hesitate to check it out. Chances are it will be gone if you wait a day or two, especially if it’s a popular car with enthusiasts. A common misconception is that all cars with a rebuild or salvage title are to be avoided at all costs. While that perception is certain not unfounded, to blindly write off all vehicles with one of those two titles can be a mistake. To give a brief explanation, a salvage title is given to a vehicle that has been written off by ICBC for any number of reasons. Once the car has been inspected, it is then given a rebuild title. Naturally your first impression at seeing a rebuild title is to run away, all the while screaming bloody murder. No one would likely fault you for that reaction. However, going back to the hidden gem topic, you can occasionally find a rebuild that’s actually worth buying. I know we have members on here that have body shops and will occasionally rebuild an ICBC write-off, but to use a broad paintbrush here, a typical frame damaged vehicle will almost never be repaired properly. Sure, it may pass an inspection and be deemed road legal, but it can end up with alignment issues that will plague it for the rest of its life on the road. Other shops have been known to replace damaged parts with subpar quality units, and even occasionally shops have been caught putting faulty airbags into cars simply in order to pass inspection. After all, inspectors wont test fire an airbag, so why bother spending all that money for something that will, in all likelihood, never be used? Personally I’d never buy a car for daily road use that had frame or pillar damage, but that’s just me. No, what I’m trying to get at here are rebuilds from theft damage. It’s not uncommon for certain vehicles to have been written off due to theft. Plenty of cars come with Recaro or Bride seats, while others have BBS or other expensive OEM (but aftermarket built) rims. Usually the cost of replacing these items exceed the value that ICBC is willing to barter up to, so off to the wrecking yard these cars go. There’s absolutely nothing wrong with these vehicles that a set of lower trim seats or rims won’t fix, and because it’s now got the rebuilt stigma attached to the title, you can occasionally find these cars for far less on the open market. However, just like maintenance records, if the owner has either photos or shop records of what was actually done to the car, you’re better off. Don’t simply trust that the GTI you’re buying was a theft recovery, only to realize down the road that it had a new back half stitch welded on. The last part of buying a car is all about money. This is what the seller tends to dread, and the buyer looks forward to. I’m sure we’ve all sold something on Craigslist and have dealt with ridiculous lowball offers. Don’t be that guy! Check out the pricing for similar vehicles online. If what the seller is asking happens to be in the same ballpark as the others, chances are extremely high that he won’t accept a stupid low amount. If that vehicle is in very good mechanical and physical shape, and the owner knows it, he may not even drop his asking price a single penny. Cars will sell for what they’re worth, or at least what the owner feels it’s worth. I’m sure we’ve all scoffed at someone asking $30k for an R33 V-Spec, but if that’s what the owner wants for it, then chances are he won’t budge. By all means offer a lower amount that you feel is fair, but don’t be offended if they laugh you off their driveway. There’s no exact science to determining how much you should counter-offer an asking price as it’s all dependant on the market value and how determined the owner is to getting rid of it. You have to basically play it by ear after getting a feel for the car and the seller. I once bought a car that was advertised for $2000 for a paltry $300. Admittedly it was only good as a parts car, but luckily that’s all I needed it for. Conversely, when I bought my Accord coupe a few years back, I paid full asking price because it was worth it. It all comes down to how good you are at negotiating and reading the other person. As a first time buyer, looking for a new used car can seem like a daunting task. Many people, including myself, enjoy the challenge that it can be, but many more dread it. If there’s one piece of advice that you should take home with you, even if you ignore everything else in this post, it’s that you should never become attached to one vehicle. Never buy out of impulse or because the seller is saying that there’s another interested party coming by in half an hour if you don’t buy it. There will always be another car, another good deal, just waiting around the corner. Don’t get yourself hyped into a situation that you will regret two blocks down the road. Be patient, do your due diligence, and be fair when negotiating. And stop asking if a Miata is a better choice than an X3. um.... is a miata a btter choice than an x3? Awesome writeup as always thanks for the tips! i think a section on how to deal with dealership trickery and used car salesmen would be helpful. Dealership related sales start to fall under legality issues, a topic I'm not terribly familiar with. I'd rather let someone who's intimate with the law and has had more experience buying used cars from a dealership take that one. Also, if there are any topics you would like to see me cover, feel free to post them below. I'm always looking for new subjects to write about and would like to make sure it's something you guys are actually interested in reading. Great article as per usual! Regardless of what the seller says, or who is selling (e.g. big dealership) always insist on getting the car inspected by an independent mechanic. The mint ISF you are looking at might have a dead rat in the engine bay (happened to me). I would recommend at a minimum BCAA. Most members here would recommend a good private shop that is familiar with the specific make. Dealerships are sometimes ok, but I've found them to give only a quick once over. If you are buying something more expensive, I'd recommend paying the extra to get a compression test done on the engine. I used to avoid dealerships because of GST. Now that the tax rules have changed, I browse dealer ads on craigslist. While the ALL CAPS ADS can be annoying, I actually find that dealers have been more reliable than a lot of the private ads on craigslist. Dealers do need to make profit, but most also have policies on holding cars more than 3 months. I've seen list pricing drop more than 20% for used cars that have been sitting on the lot for 90+ days. On the other hand, be careful which dealership you go to: obviously, be very careful if you are at a less reputable dealer on kingsway, surrey, etc. If you are buying a late model used car, I suggest looking on Canadian Black Book. You can get free access at toyota.ca. This can be useful because if the seller is looking to trade-in at a dealer, Black book gives a pretty close assessment to what a dealer will give him/her. Keep in mind that black book is pretty useless for anything older than 10 years - you're not going to be able negotiate that 91 NSX down because black book says the price is $10K lower. Also, make sure you look everywhere, not just craigslist. autotrader, kijiji, revscene, etc. You might want to expand your search to the states for rarer cars and also late model used cars. The extra hassle might net you a better condition car at lower price. is it possible to have a list of independent mechanics or shops that are willing to do vehicle inspections in particular areas? maybe even a list of places for specific brands of cars too?